Although I’d known about the little plastic Winpro 35 for years, I wasn’t really interested in it until recently. I have some in my collection, picked up at garage sales and flea markets for as little as a dollar, and I sometimes wondered about the Webster Industries firm that made it. Even though I’ve lived in Webster since 1985 or so, I never gave it much thought. My interests in camera collecting didn’t include cheapo plastic products with few distinguishing characteristics. That changed about a year ago when my phone rang and John Hallauer, a Webster man, asked if I would like to take a box full of old photo equipment off his hands. He said he got my name from the vintage camera display I set up in the Webster Museum’s display case at the local library. His call wasn’t the first response I got from that little show, but he was the only one who offered some free stuff. It turned out he had some Winpro items in one of the boxes he showed me, including a black leather field case, a flash gun and an eight-by-ten photo from a 1940s trade fair showing dozens of new Winpros stacked up like canned peas in Hegedorns. I asked about the picture, and that’s when the hook was set. It turned out Mr. Hallauer was once a neighbor of a Webster Industries co-founder, the late Claude Wright, and what’s more, he knew a lot about the history of the venture. I quickly grabbed a pen and paper and started jotting barely legible notes as he spoke. When I got home with the treasures he gave me, I scoured my store room for any other Winpro cameras I had stashed and gathered it all together. I had to know the whole story, from the post WW2 founding to the demise in 1955. Other than Mr. Hallauer’s recollections, I didn’t uncover much. My trusty McKeown’s Guide, a hallowed publication most camera collectors rely on, had very little to say about Winpro, and valued it at $15-30 in pristine condition. The archives at George Eastman House had only an advertising flyer and a couple of the cameras. No help there. In the meantime, the Webster Museum asked if I’d put up a display in their showcases and give a short talk as part of their series on collecting. I thought it’d be appropriate to devote a large space to the Winpro to give the show a touch of local color. That move brought some unexpected responses from people who were connected to the company in some way. First heard from was Lorrie Jones, Claude Wright’s daughter, who I talked to at length about her father’s enterprises. Not only did he help start the camera business, he was the Wright in the Wright-Wisner beverage distributing firm. Later, with his Winpro partners Jim Morrisey and James P. Wilmot, he went into the commercial real estate development business as Wilmorite, a word created from the partners’ names. Next I met Jane Henne, the widow of Winpro chief designer Julius Henne. 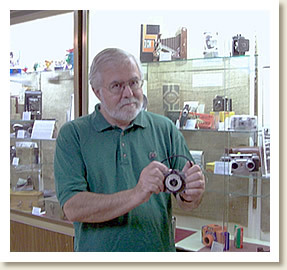 Mr. Henne was hired from Kodak to engineer a workable camera from a design purchased from the Kryptar Corp., a forerunner of Dynacolor, maker of inexpensive (cheaper than Kodak) color film. Henne had to make some radical changes to the Kryptar design, originally laid out by Chester Crumrine, a man best known for his work on 1930s Kodak Art-Deco classics, including the Bantam Special. Henne was granted several patents for his Winpro work, which I printed out after downloading the files from the US Patent Office’s website. Those patent drawings made up part of my Museum display, and showed what a clever mind Mr. Henne possessed. The Winpro is claimed to be the first plastic injection-molded thirty-five millimeter camera, and I’ve found no evidence to refute this. Although the Winpro firm was set on a course that would find it competing with giants like Eastman Kodak, they needed Kodak’s help to make it happen. Besides luring Julius Henne from EKCo., Winpro chose Tenite plastic for the camera bodies. I knew nothing about Tenite, but learned it was invented by Kodak in 1929 and produced in great quantities by their Eastman Chemical plant in Tennesee. Tenite is made from cellulose extracted from softwood, and is regarded as the first modern thermo-plastic. The grade Winpro chose gave them a strong, stable, attractive product. Cameras were made in either gray or black Tenite and proved to be quite rugged. The body molds were made for Winpro by General Electric, another pioneer in synthetic materials. As a publicity stunt, Winpro cameras were dropped from tall buildings and survived intact and in working order. None of their competitors, which included Argus, Kodak and Ansco dared attempt such a feat. 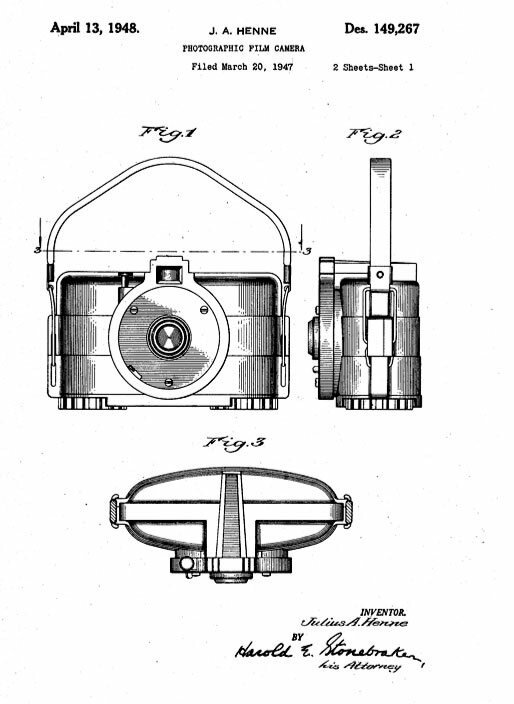 At $10.95, the camera proved to be very popular with buyers, and over 150,000 were sold in less than two years, a remarkable record for such a small player. By then, Claude Wright had left the operation, and the remaining owners moved the entire factory to Horseheads, NY near Elmira, thus closing the chapter on camera manufacturing in Webster. In the process of digging up bits and pieces about Winpro, I got some major help from a couple members of The Photographic Historical Society, a Rochester-based group I have been part of for almost thirty years. The first find was a four-page write-up in a 1972 book “Glass, Brass, & Chrome” co-authored by Joseph A. Bailey, who was already a long-time member of the Society when I joined. Bailey’s Winpro information included all the names, dates and places, and is probably the most complete resource for Winpro facts to be found anywhere, at least so far. I’m convinced that there are still a stack of file boxes somewhere crammed with enough documentation to keep me busy for a lifetime. Even more mysterious was the Winpro 3-D Stereo camera, which I never knew existed, but Phil Sterritt sent me scans of two magazine clippings for just such a camera. The image in the ads looks like the regular body but elongated enough to fit two existing lens-shutter asemblies. The announcement lists the price as $39.95, and that it was “Coming Soon.” The manufacturer’s name on the ad was Winpro Camera Co, Division of Monroe Research Corp of Rochester, which dates the clippings as being from 1953-54, when the business was purchased by Herb Pfeiffer and Morris Cassorla, co-owners of a warehouse business in Rochester. Winpro’s Stereo was billed as the first low-priced 35mm stereo camera, which may be why it never made it to market. That same claim was made by the Universal Camera Corp’s Univex Stere-All, which was announced at about the same time. Although the Univex Stere-All wasn’t as stylish as the Winpro design, and was priced higher ($49.95), Universal was a much larger company, although at that time it was struggling to emerge from bankruptcy. In addition, public interest in 3-D photography was trending downward, and neither Winpro nor Univex would survive until the next stereo boom. That may have been the last gasp for the Winpro. The company, by then renamed Zenith Film Corp., pressed onward but sputtered and stalled. Production had been subcontracted out and the quality levels achieved by the Webster operation were never seen again. Sales tanked and the remaining stock of cameras was blown out in 1955 for $7.95 each. Most of the Winpros I see today are still in working order, and under the right conditions, can make pleasing pictures. I found a large gallery of artistic color photographs on a website created by a Texas woman, who told me the Winpro is her favorite tool. Her camera is one of the few that have warped with age, and it does leak light sometimes, but that’s part of the charm for her. I offered her one of my light-tight ones, but she declined. It wouldn’t be the same.